A deal to develop 260 residential blocks, a retirement village and shops just outside The Gap is at a stalemate. The picturesque land, 150 hectares on the southern flank of the ranges, off Ragonesi Road, is owned by Ron Sterry. The project has been limping along for some 10 years with some of the roads, sewerage and storm water drains in place, but no work in progress at present. Last year a consortium of local and interstate interests made an offer to Mr Sterry with the intention of starting work immediately towards the completion of the development. The head of the consortium, David Cantwell, who co-owns a project management and certifying business in Alice Springs, says the offer is worth $15m. Contracts were drawn up following an undertaking by Mr Sterry to proceed. However, Mr Sterry pulled out of the deal at the “very last moment”. Mr Cantwell says the offer had been to assume Mr Sterry’s current obligations, and then pay him a percentage of the value of each building upon completion. Mr Cantwell says engineering drawings as well as most of the permissions from the government and service authorities had already been obtained by the consortium, at considerable cost, when the negotiations stalled in May last year. 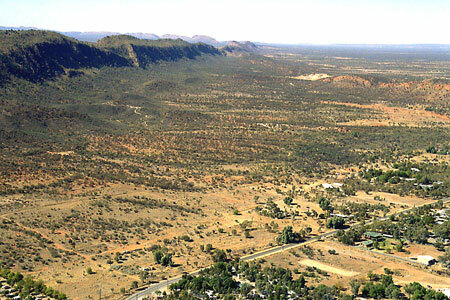 The project was conceived at the height of shortage of residential land in Alice Springs. PICTURES: Top left – The site from the air. Above right: Planned lay-out and staging of the development. 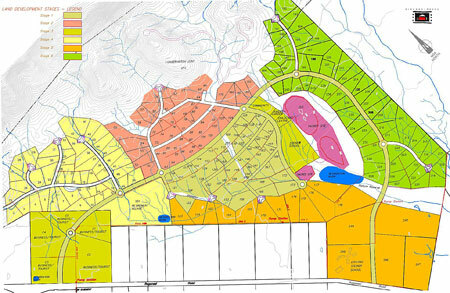 The green square at bottom left of the plan is for use by businesses, tourism and a retirement village. The white rectangles bottom centre are rural residential blocks not part of the Sterry development. To the right of these is the Steiner School. The blue areas are retardation basins, and the mauve ones, sacred sites. The stages of residential development are (from 1 to 6) light green, pink, darker green, yellow, orange and dark green. Hmmmm. You are right, Janet. I see by your response that we do indeed have very little in common, and that any vision you have for the town does not extend much past issues relating to development and business interests. I don’t believe you will ever see the relevance of social, cultural and environmental issues in planning a sustainable future for The Alice, as demonstrated by your silver bullet solution of more land releases. You seem to believe in an economy-led recovery for the town, whereas I believe that a vibrant economy will come about as a natural consequence of our repairing and looking after the town’s environmental, social and cultural assets. As such, I doubt we will ever see eye-to-eye. Dom. You assume too easily. Just like building a house good strong foundations are needed. A town plan is not about bottom up or top down it is about forward projections of land availability for investment and growth. And I am not a supporter of dictatorship. I do not support the new growth industry of incarceration. Maybe coffee one day to understand each other. Cheers. Janet, you touch on some very valid points and seem to appreciate that the many issues faced by our town, such as affordable accommodation and the well-being of local businesses, are inter-linked. In that sense, a town is not unlike a human body, in that all of its “parts” need to be in good condition for it to survive and thrive. I’ve also heard you call for a “Town Plan”, something we do agree upon, although I suspect your idea of a such a plan is “top-down” (that is, law and order-based and somewhat dictatorial) whereas mine is “bottom-up” (that is, community-based and, I’d like to think, more democratic). Nevertheless, I’d like to read more from you about your vision for the town and how it can be achieved, for I suspect we may have more in common than at first glance. Janet, you stated in an earlier post that “we are not greedy.” As Steve often uses the royal “we”, are you referring to yourselves or the town here? If you’re referring to the latter than your statement “greed and opportunity engulfed our town” is contradictory, but maybe you’ve seen the light and I’m not trying to be facetious. I’ve already pointed out that the business practices Steve supports, includes the real estate heist that you, sagely, refer to here, so it’s refreshing to see that you and I appear to agree. Your comments about those exhibiting “bad behavior” taking responsibility for their actions is finally echoed in your comment about the town and its residents taking some responsibility. You are right in saying “we are in trouble,” but you continue to blame the government. The debate about leadership seems to be more about not knowing how to get the town out of trouble, although some are pretty sure of themselves. It’s not all about standing up. There are people fighting for the survival of Alice Springs and its people. I refer here, specifically, to the People’s Alcohol Action Coalition and others who are just as concerned as you and have been standing up for some time, often in the face of hateful commentary. You continue to ignore their professional expertise, particularly medical and economic reasons for their concern. Isn’t it about time that you considered it? Young families have struggled to pay the enormous rents along with the over priced dumps that people could buy at over-inflated prices. Greed and opportunity engulfed our town and driven young people and families out. Jobs a plenty but no affordable rentals or purchases. If you work and take home $400 a week and pay that for rent of a two bed unit you need a partner or rent out the other room. But that still equates to 50% of wage. Power, food, fuel, phone – not a lot to go out. So our pubs clubs and other businesses suffer due to limited spending. Our town is showing the effects of that and still most do not acknowledge we are responsible for where we are. We were part of a group that was lobbying for land release since 2005 and ignored the real estates in town which grew in staffing and informed the government we do not need land releases. Today’s hand out for the almighty dollar. But tomorrow is here and we are in trouble. A government that ignored our needs for survival. Elected aldermen and mayor who kept telling themselves “it’s not our problem”. So who are elected members representing if not the residents of Alice? This election we need to elect people who will fight for our town. People with a history of standing up for our town when no one else would. People who demanded safety on our streets. People who love Alice. Do not waste your vote on those who are there for the formalities and junkets. If you choose the latter we will still fight for our home but life will get tougher and change will be a whisper that no-one will hear or see. Judging from the increased number of real estate listings in our local papers, I suspect that the recent “housing shortage” is well and truly over and that we may be moving back into a “buyer’s market”. I hope I’ll be proven wrong by history, but the planned land releases from AZRI, the old Drive-In site and Mt Johns Valley may turn out to be the straws that break the real estate camel’s back. No wonder the place is dying – if it takes 10 to 20 years to get anything done – or are there some other factors that are not known? On the surface it looks like there is always someone to stop Alice getting what it needs.